Is The Ethereum Code a Scam? Beware, Read this Review Now! Remember The Bitcoin Code we reviewed recently? They were using the name of a popular cryptocurrency to attract traders. They also faked results by showing badly edited trading outcomes and made up fake reviews. Today, we have found another similar BS to that also uses a cryptocurrency’s name, Ethereum. How exactly can we be sure this one is or isn’t a scam? Well, it’s pretty obviously a scam but in order to prove it its time to put our BS-detecting glasses on and dig deeper into this new service! 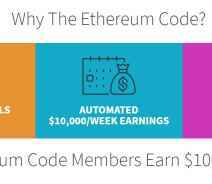 Ethereum Code – What’s the BS Factor? It only takes a second for my BS-o-meter to hit max level upon visiting the Ethereum Code website. Why? Because at the top of their page, they claim to have been published on Forbes, CNN, and many other reliable financial services. Obviously, there are no such stories on any of those websites about this service so it’s just a marketing trick or better put; a big lie. The next alarming part is the long pitch video that is made entirely focuses on making the client hurry into opening an account. They use the good old “fear factor”, you know “of losing an opportunity” and play on people’s greed. 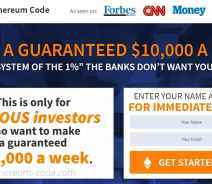 What they promise is easy and fast money like every other scam does. 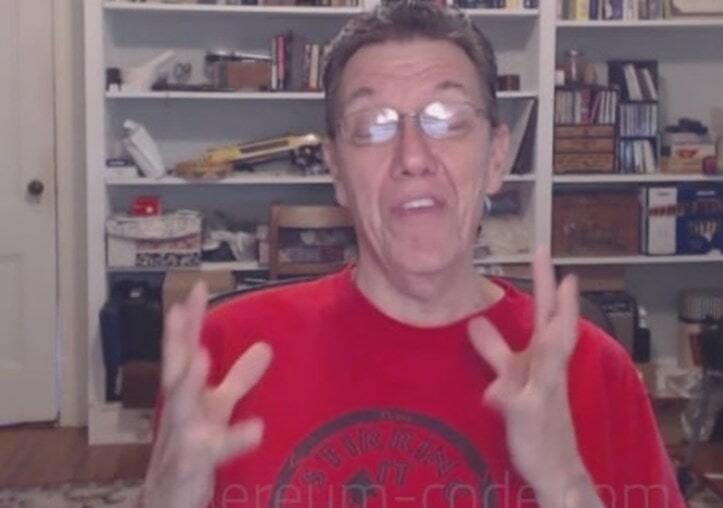 How about the people who appear in the video, vouching for the Ethereum Code? 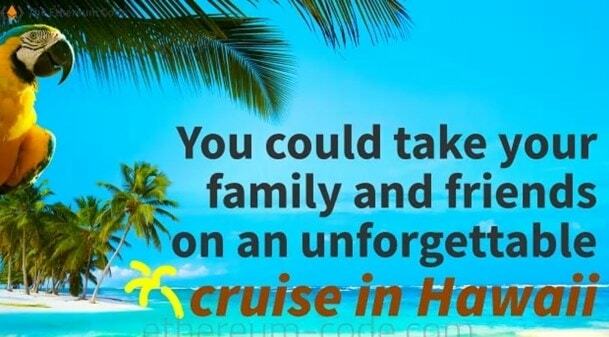 First of all, why are they so desperate to have us onboard? If they are making money and the spots are as limited as they claim, plus all the marketing they are getting from their supposed articles on Forbes and CNN then those spots should be or have been filled already! Of course, as we concluded before, there are no such articles and the truth is that these “testifies” are coming from actors and the ultimate goal is to make you deposit money into their brokers! 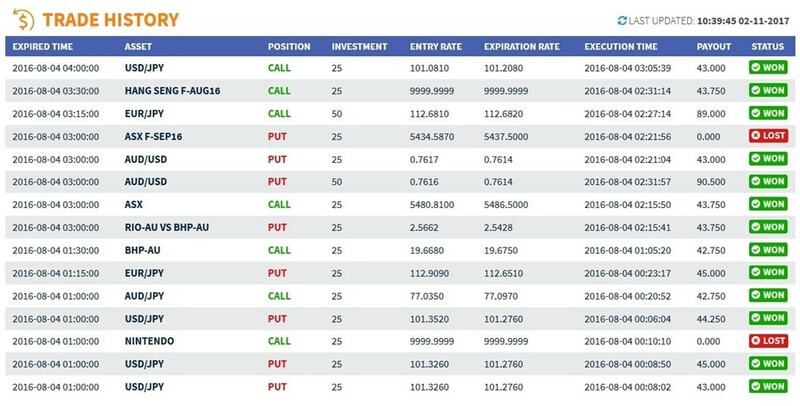 To be honest, there was no mentioning about Binary Options nor Binary Brokers in the video but as soon as you sign up, you must make an initial deposit to a broker in order to get this “free” software. 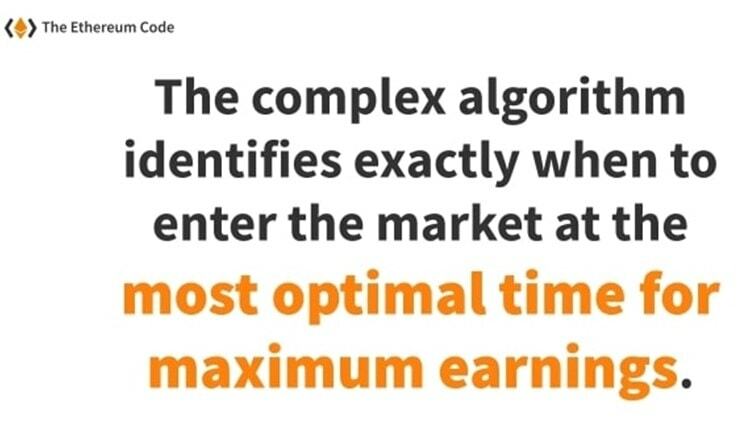 “YOU MAY AND SHOULD ASSUME YOU WILL PROBABLY WILL LOSE MONEY TRADING. THEREFORE WE DO NOT GUARANTEE OR IMPLY THAT YOU WILL BE A SUCCESSFUL, PROFITABLE TRADER, OR MAKE ANY MONEY AT ALL IN YOUR TRADING USING OUR SERVICE.” – Ethereum Code Terms and Conditions. “The videos displayed on the Website are provided for informational and promotional purposes only and should not be relied upon in making decisions and are for simulation only by using actor(s) and demo accounts” – Ethereum Code Terms and Conditions. That’s right folks, the video is fake and testimonials are from hired actors, simulating results that you may be able to acheive. 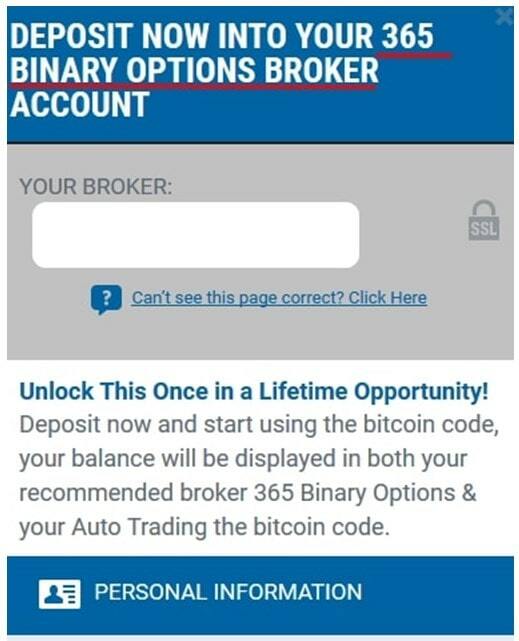 This entire scam was made for one purpose, to lead you into a trap with a bad Binary Options broker who partners with such crooks.I signed up with a fake email and got assigned 365 Binary Option. It’s needless to say they are awful and a scam. At the bottom of the Ethereum Code page, you will find “Support”. Great huh? Well, not so much. Clicking support just takes you to the top of the page and restarts the damned video! Same happens when you click the “Report Abuse”. What abuse would that be by the way? The only abusers here are the people behind this scam. By the way, who are the people behind it? Oh, that’s right, we don’t know since it’s all a bunch of fake stories and fake names with absolutely no information on the business behind this awesome deal! However, I do have a clue. I think these people are the same people behind many other scams – including the BitCoin Code scam! In fact, I can prove it. Keep reading! Ethereum Code – These are photoshopped! Notice dates, time stamps and price rates and compare to the image below. BitCoin Code – Fake and same image as the one found on ETH Code. Notice how even the dates and price rates are similar? In fact, this is the THIRD time I come across this same exact image! Yes, not the second, but the THIRD time! The first time was of course on the BitCoin Code Scam, the second time I saw it was when we reviewed the 30K challenge Scam and now, it appears here too! These scammers are getting lazy I guess. I would like to add that even if the image did not appear anywhere else before, they are still fake results which I exposed already inside the BitCoin Code review. 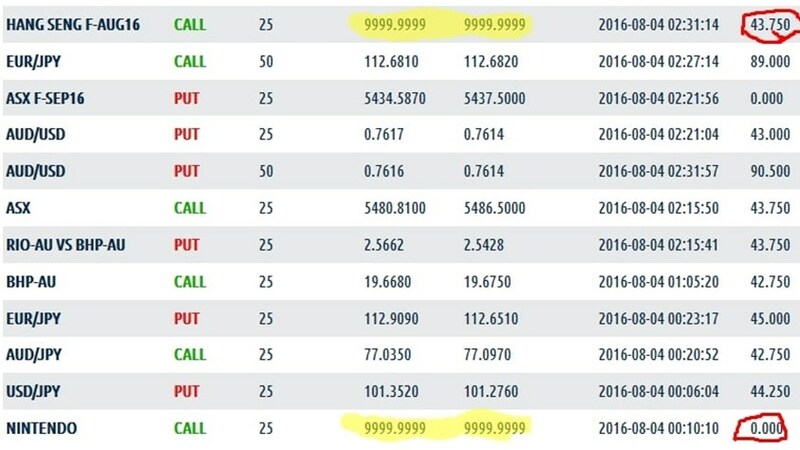 I always say; once you have seen one Binary Options scam and learned to expose it, you know how to expose them all. This was a great case and a great example of how these people operate. If something works once they will just rebrand and reuse it again and again until we, the trading public, learn to stay away. You will find this to be true for pretty much all other autotrader and robot scams in the binary options industry. Just apply the same methods we used above and you will expose it within minutes! I have one question with the legitimacy of the reviews has anybody actually tested it? With shown results to prove its a scam. Ive read many Reviews and seen all the black listed software,but not review actually states that its been tried and tested. Can anyone tell and show authentic reviews before calling everything a scam? right then, I don’t know what’s going on here. I recently did a scam report on the ethereum code and the information said it was legit. I decided to open an account, but today just to satisfy myself I did another one only to read that it’s a scam. Confused,? I sure am. I am at present trading, using the binary robot 365 on the roiteks platform. that is not proforming anything like advertised. I definitely will not be putting anymore funds into that account unless there is some positive movements. that said, the scam reports has been very helpful. Yikes, I did register but I haven’t given them any financial details yet! Do I have anything to worry about, they only have my name, email, and phone number? Hey there. Glad you didn’t deposit. Well, they may sell your phone number and email. If you get too many phone calls from numbers you don’t recognize and from other countries you can get call block for your phone. If you are lucky they don’t. Just don’t answer them and they will give up! Good luck. Also, remember, all these robots and easy money schemes are scams! Thank you Martin Kay for that wake up call , I was almost registered.